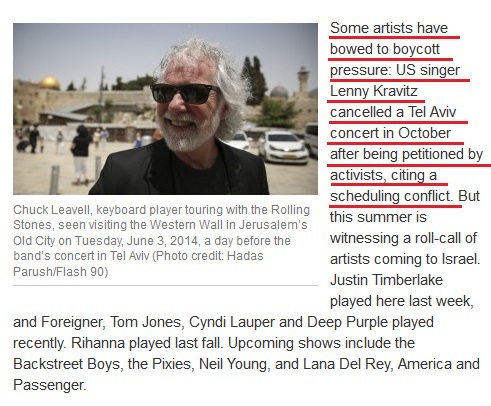 Dispelling rumors that singer Lenny Kravitz may have canceled his planned October 6 Tel Aviv show due to political reasons or poor ticket sales, producer Gad Oron told The Times of Israel that a total of 10 September and October shows — in Russia, the Ukraine, Finland, Serbia, Romania, Bulgaria, Macedonia and Turkey — were canceled because of Kravitz’s extended filming schedule. 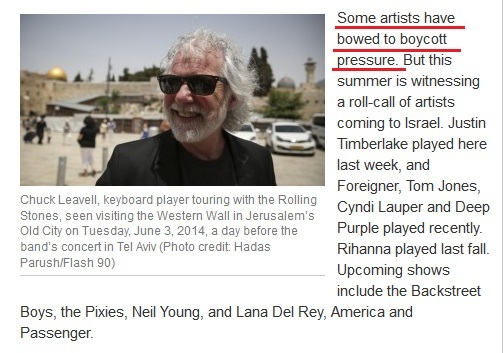 Ynet also reported that Kravitz canceled his European performances, in addition to his Tel Aviv show, due to a scheduling problem. Google translate of a Turkish siteconfirms that he canceled his Oct. 4, 2012 Istanbul show. Likewise, Concierge Groupconfirms that Kravitz postponed the Kiev show, and the Diplomat(Bucharest) reports on the star’s postponement of his performance in that city. While CAMERA commends editors for having removed the erroneous claim, we note that, contrary to common journalistic practice, no correction is appended to the article. A “stealth” correction of this sort does not ensure transparency regarding the correction of misinformation, and CAMERA has requested clarification of The Times of Israel’s correction policy.